If you are looking for excellent quality Bradoon Bits you came to the right place. Here at Horse Tack Now we strive to offer the finest horse bits at low wholesale prices. All of our bits are in stock and ready to ship out. The single joint creates a snapping action between the rings and mouthpiece. The mouthpiece slides on the rings in the loose ring style creating potential comfort in the horses mouth. The German Silver Solid Mouth Bradoon Bit that we offer is a top quality bit for your horse. 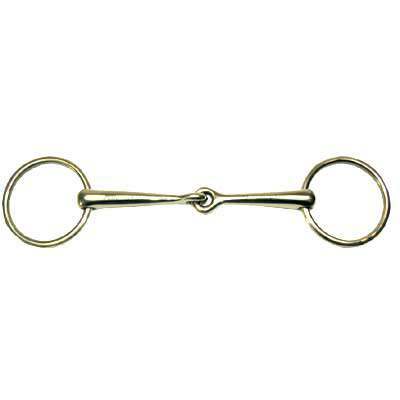 This is a Bradoon single jointed solid mouth snaffle bit. This item is also made of pure solid german silver and measures 2 1/4'' rings and 10mm mouth. If you are in need of Bradoon Bits we have just what you need for your horses at unbeatable prices. We strive to offer the lowest prices for our quality products and your complete satisfaction is our number one priority here at Horse Tack Now.